You’ve done the hard work of picking out the ring and proposing, but you had no idea what kind of adventure you were about to embark on: wedding planning. It’s a whole new world of decision making, budgeting (or budget breaking), and you have never seen this side of your soon-to-be bride (interpret that at your own risk). Wedding planning may seem an overwhelming task and one that you have little to do with, but there are plenty of ways you can lend a hand. Listed below are five suggestions for how you can be involved in the wedding planning process. Coming up with the guest list is a task your bride can’t accomplish without you! Compile a list of your friends and family to combine with her list and help her make the tough decision of who to keep and who to leave out. This is one of the hardest parts of wedding planning because you feel like you’re ranking your friends and family by importance -but you are. Your budget depends on it. The best way to keep your list from going overboard is to limit it to closest friends and family. Then, depending on that number, you can expand from there. Deciding where you will have your wedding is one of the fun parts of wedding planning. This is your wedding too! Are there any places you think would make an especially nice reception hall or venue that would set your ceremony apart? Get creative and share your ideas with your fiancee. You can also help by being aware of factors that can easily spike venue costs -catering fees (do they allow outside caterers? ), how the venue handles booze (whether or not you have to provide your own) and what the guest parking situation is. If you’re familiar with these factors, you can help determine the best venue option. And if you want to go above and beyond, suggest getting an event rental coordinator like the ones at RSVP Event Rentals to help make your venue look amazing. This is all you. Besides discussing the size of your wedding party beforehand so you don’t wind up with twelve groomsmen and five bridesmaids, you have total control over who stands beside you on the biggest day of your life. Who doesn’t like making a list of things you want people to buy for you? This is exactly what you get to do when you register. Plus, you get to use a cool, scanner gun while you’re doing it. She’ll probably register for nice, practical things -china, bedding, towels, etc. This is your opportunity to register for fun things -a cool set of beer glasses, a popcorn maker, boardgames. Tropical island oasis, romantic Smoky Mountain cabin, cool coastal cruise? What will it be? Book a honeymoon the two of you will love. This is one less thing she has to plan, and something you both can look forward to on the days where wedding stress is at an all-time high. 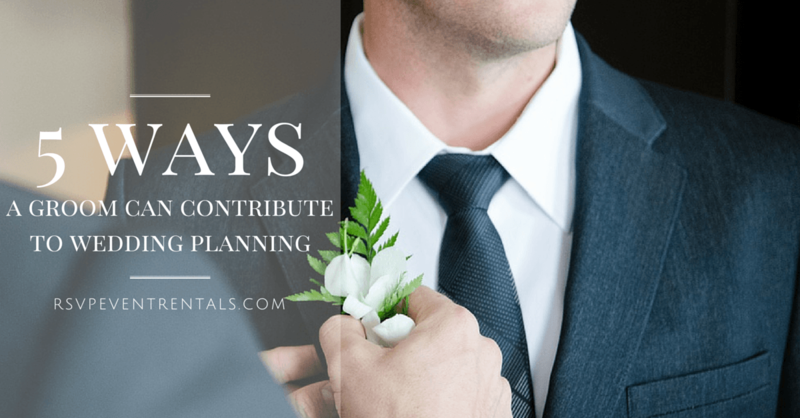 Wedding planning can be overwhelming, but there are plenty of things you can do as a groom to be involved in the process. What is something you would add to the list?